← Goodbye /slash – Hello Viennale! 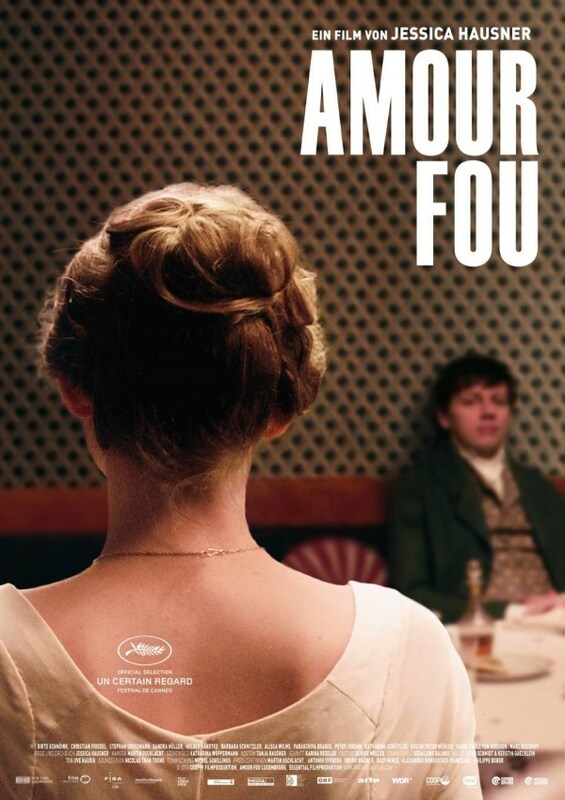 “Amour Fou” is a very weird and strange film – which is not to say that it’s bad, but that it takes some getting used to, and for some, it probably won’t be worth the effort. The very old-fashioned, sophisticated speech, the extremely polite and reserved behavior of the protagonists, the theatre-like staging, the indoor-sets… “Amour Fou” offers a window into a totally different world. Not just because it’s story takes place about 200 years in the past, but also because of its contemplation of the aristocracy of that time. Thus, it took me a while to really find into the movie. What ultimately won me over – and also surprised me, given its subject; it deals with suicide, after all, which is still a highly risky and often hushed-up topic – was how funny it was at times. One of my favorite scenes of the movie is when Heinrich gets pissed off by a colleague of his – and he shows his distaste by rising quickly from the table and telling him, in a calm voice, that he is annoyed by him, and that he will now go to his room. And that’s it. I also liked how they used one of the tropes of romantic comedy – the bad timing – in a kinda dark way; since in this case, it wasn’t about them finally getting together, but dying together. I also liked the landscapes (few as they were), the performances of the actors (especially the three leads Birte Schnoeink, Stephan Grossmann and Christian Friedel), the sets, art direction, and the costumes. What I could have done without: The singing. It’s not that I didn’t like those scenes at all; on the contrary, the lyrics are actually quite revealing, and relevant for the struggle of Heinrich and Henriette. But hearing one song twice and the other one even three times, was just a little bit too much. After the fourth song performance, it really started to get tired. There is also a coldness and a dispassion to the movie that, while in a way part of its charm, unfortunately also meant that the ending didn’t quite have the emotional punch that I would have hoped for. Again, it’s actually more darkly funny, than touching or tragic. Also: In a way, it was very poignant that Henriette tried to speak out, but was cut short by him; on the other hand, it made it a little bit difficult to feel for her. Why didn’t she tell him sooner? And I really could have done without the final revelation about her sickness. Ultimately, as darkly funny and thus entertaining as I might have found it, I felt myself being much more emotionally detached from it as I would have liked. Still, if you’re fascinated by this era and/or german lyricists, you should definitely check it out. This entry was posted in cinema 2014, movie reviews, Viennale and tagged Amour Fou, Jessica Hausner, Viennale 2014. Bookmark the permalink.